Top Four Tips From an Emergency Dentist in Spring Lake! Y ou’ve been looking forward to blowing off steam at your basketball game all week. You love spending time with your buddies and getting some exercise at the same time! But, as you’re about halfway through the game, a ball hits you directly in the face and chips one of your front teeth. Fortunately, an emergency dentist in Spring Lake is just a phone call away. But what should you do in the meantime? 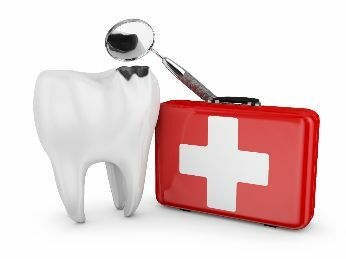 And how can you handle other common dental emergencies? Keep reading to find out! How Should You Handle the Four Most Common Dental Emergencies? Knocked Out Tooth – If you’ve knocked out a tooth, it’s important to come in as soon as possible, since the chances of saving the tooth are much higher if you’re seen within an hour. It’s also crucial that the tooth stays moist until your appointment. Gently rinse the tooth off and try to put it back into the socket, making sure not to touch the root. If this isn’t possible, you can also put it in a glass of milk instead (saliva or water will also work). Apply gentle pressure to the area with a clean, damp towel to reduce bleeding until you can be seen. Chipped or Broken Tooth – Rinse your mouth out with lukewarm water and call to make an appointment with an emergency dentist in Spring Lake. If you have a sharp edge that’s uncomfortable to your tongue, try an over-the-counter, temporary dental cement to cover it. Toothache – Toothaches can be very painful, so call right away to schedule treatment. Also, if you notice a pimple-like bump on your gum tissue near the tooth, chances are good that you have an infection. This situation needs to be addressed immediately so that it doesn’t spread to the other areas of the body, which can be very dangerous. Jaw Pain or Injury – If you simply have an achy jaw, schedule an appointment so a dentist can evaluate your temporomandibular joint. If you think you’ve broken your jaw, head to the nearest emergency room right away. Once you’re stabilized, you can schedule an appointment for any dental restoration that needs to be done. Wear a sports guard – Athletes are highly prone to oral injuries without proper protection. Research has shown that custom-made sports guards protect the teeth and gums while also preventing head and neck injuries! Avoid using your teeth as tools – Using your teeth to cut open bags, packages (and certainly bottles) puts you at high risk of chipping a tooth. Be careful with diet – Don’t chew on things like hard candy, ice or popcorn kernels, as these foods can easily break a tooth. Dental emergencies are never fun. But with these tips, you’ll be better able to prevent them from happening – or handle them if they do! Dr. Edward Dooley was born and raised in Spring Lake and gets immense professional satisfaction from serving his community’s dental needs. In addition to providing outstanding general dentistry, he always makes sure to reserve time in his schedule for emergencies. If you have any questions, he can be contacted via his website or at (732) 974 -2288. Comments Off on Top Four Tips From an Emergency Dentist in Spring Lake!